366 pages | 77 B/W Illus. Incomplete or missed requirements, omissions, ambiguous product features, lack of user involvement, unrealistic customer expectations, and the proverbial scope creep can result in cost overruns, missed deadlines, poor product quality, and can very well ruin a project. 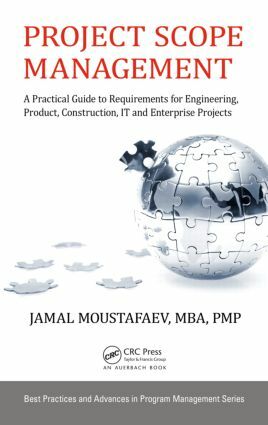 Project Scope Management: A Practical Guide to Requirements for Engineering, Product, Construction, IT and Enterprise Projects describes how to elicit, document, and manage requirements to control project scope creep. It also explains how to manage project stakeholders to minimize the risk of an ever-growing list of user requirements. After reading this book, you will learn how to create project charters, high-level scope, detailed requirements specifications, requirements management plans, traceability matrices, and a work breakdown structure for the projects covered. Introduction to Scope Management: Who? What? Why? Why Write a Book about Project Scope Management? What Is Included in the Project Charters? What Is the Requirements Engineering Process? Who Is a Requirements Analyst? Why Do We Neglect the Customer? How Do We Find the Requirements Owners? How Formal Should One Get? What Are the Benefits of Meeting Minutes? What Are the Requirements Writing Guidelines? When Does One Write the RMP and the RTM? What Are the RTM Benefits? How Complicated Can the Design Process Get? What Is the Best Practices Approach? Jamal Moustafaev, MBA, PMP, president and founder of Thinktank Consulting, is an internationally acclaimed expert in the areas of project/portfolio management, project scoping, process improvement, and corporate training. He has completed projects for private sector companies and government organizations in the United States, Canada, Europe, Asia, and the Middle East, including the US Department of Defense (USA), Siemens (Germany), Petronas Oil (Malaysia), and TeliaSonera (Sweden), to name a few.